I know I’m a sap when it comes to family movies and you throw in kids and a dog, in this case a beautiful Alaskan Malamute. I’m sure I’ll be hooked, so I’m going to go find me a copy of this movie. However, you our lucky readers get a chance to win a copy! 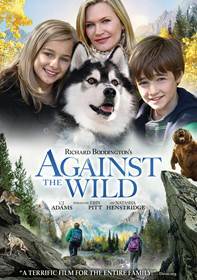 One lucky reader will win their very own copy of Against the Wild on DVD. Open to legal residents of the fifty (50) United States and District of Columbia! Giveaway ends 3/24! Simply, Follow the instruction below on the rafflecopter for your chance to win! I’m not sure if I could survive in the wild. I could definitely survive in the wild. For a few days. Then a bear or coyote would probably eat me. Dang, im so spoiled I would have to take my husband. I think I could,but don’t want to be put to the test to find out. I definitely could NOT. I need my bug free home and warm shower! I think i could survive. I’ve camped and i have also watched tons of survival shows. no i couldnt survive in the wild. I do not think I would survive for very long. I’ve had a lot of EMS training so I think I could survive for a while. I am not a wilderness person. I’d be able to survive for a little while, but probably not too long. If it was for a night or maybe two I might be okay depending where I was or if I was with someone. Definitely Yes! Me and my husband are big time survivalists! We regularly practice different small techniques such as fire starting, water purifying, shelter building and snares/weaponry. We have pretty much every episode of Survivorman, Man vs. Wild, Dual Survival, Man Woman Wild, I Shouldn’t Be Alive and various other shows that we repeatedly watch. We are NOT Doomsday preppers, we just like to be prepared, and we have a lot of fun practicing together, since we live in a small country town and go camping a lot. Nope, I don’t do bugs! I couldn’t survive by myself but if my husband was with me I would have a chance. I could not survive in the wild. I love the amenities of home. I could have survived in the wild in my younger years. I have to many health issues now. I probably wouldn’t make it too long now. I really don’t think I could survive in the wild. I don’t much care for bugs. Um. NO. I could not. First of all I have an internet addiction. Secondly I don’t know a lot about surving in the wild and thirdly I am out of shape. I have seen Bear Grylls and he does some things to show you how to survive and I can’t do most of them. Dang I don’t even have a paracord bracelet. C’mon! My husband and I were homeless for almost a year. We were living in campgrounds not quite the same as the wild but I think if we were together we could survive. No, not me. I’m to much a girly girl. With my limitations I don’t think so. I think I could survive the wild, I watch all of those survivor shows and I learned a lot. I Maybe Could Survive The Wild, I Watch A lot Of Wilderness Shows And Get Helpful Tips. I would give it a good try! I probably couldn’t survive. I don’t even go camping. I think in the summer I would make it for a bit because I love the outdoors but winter no way no how. I can hardly survive winter indoors. If it’s not in the dead of winter, I think I could. Me and cold just don’t get along – I’d die from hypothermia! I could maybe survive if I had someone with me to keep me from losing hope. If I was by myself I do not think I would have the skills.